My friend Beverley was sharing stories with me about growing up in England. She noted her favorite goods from her childhood and how much she missed the taste of her favorite British Biscuits made with plump golden raisins. Her story inspired me to create this recipe. Hopefully this delicious scone will take her back to the days of growing up in Europe. Preheat oven to 375. 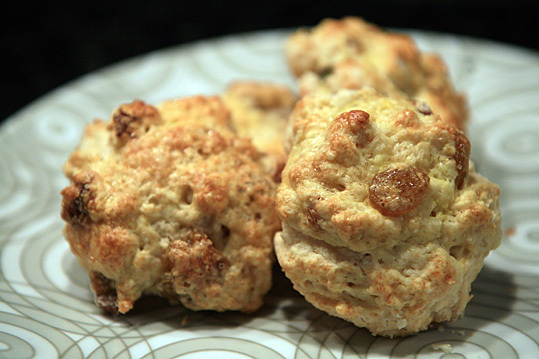 Combine biscuit mix, sugar, salt and raisins. Add in milk and gently fold together. Dust your spoon and hands with flour before handling the dough so it won’t stick. Scoop small mounds onto a greased cookie sheet. If the mounds become sticky, add more flour. Brush the mounds with egg wash and sprinkle with a little sugar. Allow to bake for 7-8 minutes. Enjoy! How cute! Hope you bring some of these in! !